with natural and found resources is so much more fulfilling than anything else. I’ve created several masterpieces with mixed media and collages to tell my different stories. You can do the same by interpreting your own emotions through a unique approach. 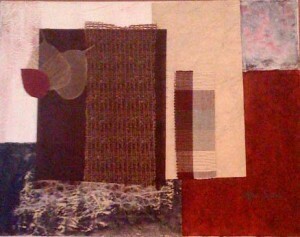 In this image, I’ve used fabric, real dried leaves and some special textured paper with veins. It is part of my series: Conserve Our Resources.